Facebook announced few weeks back that they will open up Facebook Instant Articles to all publishers in the world. That is about to happen now with a WordPress plugin released by Facebook along with Automattic, the company behind WordPress. Instant Articles launched by Facebook last year is aimed at improving the user experience of users, Instant Articles are hosted on Facebook servers and they will load quickly compared to the publication site they come from. Facebook has tested this service with a handful of publications earlier and it is allowing small blogs also to the service with the launch of this WordPress Plugin developed by Automattic. We’re always looking for ways to make it easier for publishers to share their content on Facebook, so we’ve partnered with Automattic, parent company of WordPress.com VIP, to build a free plugin for Instant Articles, which simplifies the process of generating and publishing Instant Articles from WordPress. 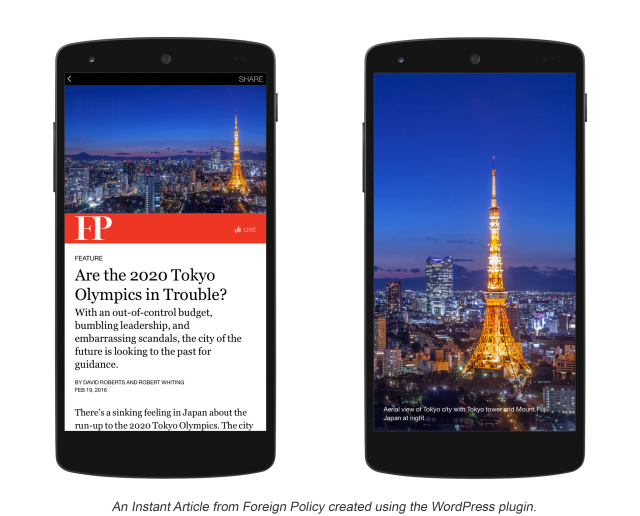 The open-source WordPress publishing platform now powers more than 25% of sites on the web, so we are excited to help millions of publishers all over the world bring the Instant Articles experience to their readers. Instant Articles are available on Web, iOS and Android as well. Publishers who wish to include their publications in the service can do so with the help of this open source WordPress plugin, the plugin will make the formatting of the articles to suit with that of the instant articles. In some cases where publishers customized their site has to tweak the plugin according to their needs. Facebook will announce this at F8 Conference on April 12th, bloggers and small publishers can use the service from then onwards. Facebook shows some examples on its announcement post to showcase how the plugin automatically recognizes images and an embedded video player in another article. The plugin supports native auto play video as well as social and interactive graphic embeds. The plugin is available from the GitHub repo if you want to have a loot at it and test things out. The articles generated from your website won’t automatically included in the service, Facebook has a review process and verifies that all instant articles are properly formatted and adhere to their community standards and content policies before you will be able to publish content to the platform.